We will update information as needed regarding events hosted by WSKO and events hosted by Shorinji Kempo Group member organizations that can be observed or attended by WSKO members. Events with Mark (*) are for Japanese Federation members. Please understand that your attendance as non-member to the Japanese Federation will not be registered as an attendance in a WSKO study session. Events with Mark (*) are recognized as the same status with the WSKO Study Session. Attendance will be registered as an attendance in a WSKO study session. June 29-30 (Sat. Sun) U.S. Federation UNITY Study Session United States Federation Monterey, CA, U.S.A.
On December 17th, 2017 has been held in Biznaga Branch Dojo, in the city of Malaga, an Open Day, part of the Christmas activities organized by the Teatinos district. The day’s practice was very pleasant and very gratifying to see how some people enjoy and learn for the first time Shorinji Kempo. The event was attended by participants and spectators of the district who came to know our art, kenshis of Biznaga Branch and friends of others Shorinji Kempo Branches. Angel Sensei (Biznaga Branch Master), prepared a varied practice with the intention of showing as much as possible to all those attending the extent of Shorinji Kempo. 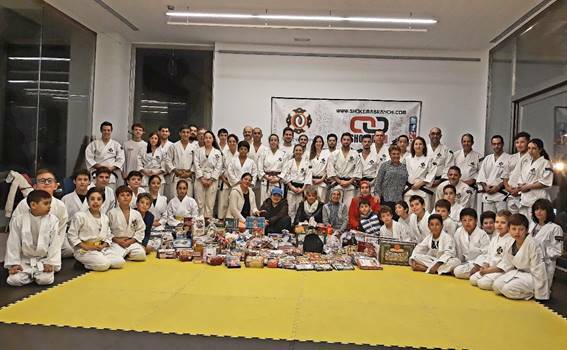 There was a little bit of everything for the promotion and dissemination of Shorinji Kempo. The practice began with a good Jumbi Undo consisting of a complete warming and stretching of the entire body. After that, Kihon was executed with movements and combinations where the importance of correct positions and weights of the body was explained. Began technical partner, alternating Goho (positions, movements, stops, hitting, kicking, etc.) and Juho (projections, dislocations, forms of detention, etc.) from different families and degrees. Gakka is fundamental part in the practice of Shorinji Kempo so, Angel Sensei also explained that Shorinji Kempo is a discipline (gyo) created by Kaiso as a method of human development through personal effort where self-confidence, courage and strength are gained (Jiko Kakuritsu) to obtain collaborative spirit and promote mutual happiness (Jita Kyoraku). The event ended with photos of the group and acknowledgements by the instructor and by the assistants for the opportunity to know the Shorinji Kempo. 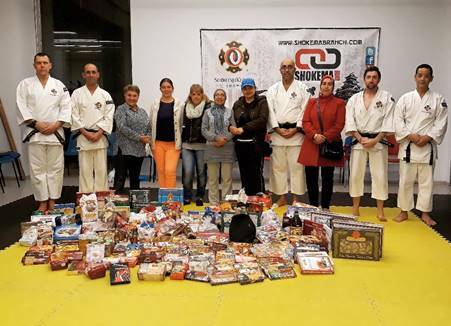 For the third year running, following the principle established by Kaiso “think of others’ happiness as well as their own”, SHOKEMA Branch in cooperation with CARRANQUE, BIZNAGA, MALAKA Branch and Themis Association ―a non-profit organization whose main function is integrating immigrants into the culture of Málaga and helping less favored people― have decided to bring Christmas a little closer to those who cannot afford it. In previous years we succeeded in collecting toys and staple food for these groups. This year we have collected Christmas food that was delivered on November 23 to the members of Themis Association, along with representatives of all the dojos who have devoted their time and effort to reach this wonderful goal that will enable a lot of families to have a merry Christmas. WSKO Secretariat office will be closed from December 28, 2017, to January 3rd, 2018. Please understand all replies to any e-mails received during this period will be on and after January 4th, 2018. We ask you for your continued support in 2018. May the year of 2018 bring you a lot of happiness and smiles.